We have identified an Ag recognized by autologous CTL on the melanoma cells of a patient who enjoyed an unusually favorable clinical evolution. The antigenic peptide, which is presented by HLA-A28 molecules, is encoded by a mutated sequence in a new gene. This gene, which was named MUM-3, is expressed ubiquitously and shows homology with the RNA helicase gene family. Limiting dilution analysis indicated that at least 0.15% of the blood CD8 T cells were tumor-specific CTL precursors. The MUM-3 Ag was recognized by 90% of these CTL, indicating that it is the dominant target Ag of the tumor-specific CTL response. The high frequency of anti-MUM-3 CTL was confirmed with tetramers of soluble HLA-A28 molecules loaded with the antigenic peptide. MUM-3 tetramers stained 1.2% of blood CD8 cells, a frequency that has never been reported for T cells directed against a strictly tumor-specific Ag. To confirm these results, the CD8 T cells that were clearly labeled with tetramers were restimulated in clonal conditions. About 90% of these cells proliferated, and all the resulting clones proved lytic and MUM-3 specific. By improving the conditions used for the in vitro restimulation of CTL precursors by the tumor cells, the same frequency could be obtained in limiting dilution analysis. These results show that some cancer patients have a high frequency of circulating CTL that are directed against a strictly tumor-specific Ag. These CTL are responsive to restimulation in vitro and are easily detected with tetramers. Such responses may therefore be an achievable goal for therapeutic vaccination with tumor-specific Ags. Cytolytic T lymphocyte clones that specifically recognize autologous tumor cells can be derived from lymphocytes of cancer patients. Many tumor Ags recognized by such CTL have been identified. They can be classified according to the pattern of expression of the parent protein (1). Two groups of Ags are present on tumor cells but not on normal cells. The first group is encoded by families of genes such as MAGE-A, BAGE, and GAGE (2, 3, 4, 5). These genes are expressed in many tumors but not in normal cells, with the exception of male germline cells, which do not carry HLA molecules and are therefore unable to present Ags to CTL. Ags encoded by genes that are mutated in the tumor constitute a second group. Several of the mutations that have been found to generate a tumor-specific Ag play a role in oncogenesis. An antigenic mutation in the CDK4 kinase prevents binding of its inhibitor, p16, thereby driving cells into cycle (6). A mutation in FLICE, a protein participating in the transmission of apoptotic signals through Fas or TNF receptors, renders cells less sensitive to apoptosis (7). A mutation in the β-catenin gene is responsible for a decreased turnover of the protein, leading to an increase in activity of the Tcf and Lef transcription factors bound to β-catenin (8, 9). We have conducted a detailed analysis of the Ags recognized by autologous CTL on the cells of melanoma patient LB33, who has enjoyed a very favorable clinical evolution and is alive 12 years after the first appearance of metastases (Fig. 1⇓) (10). 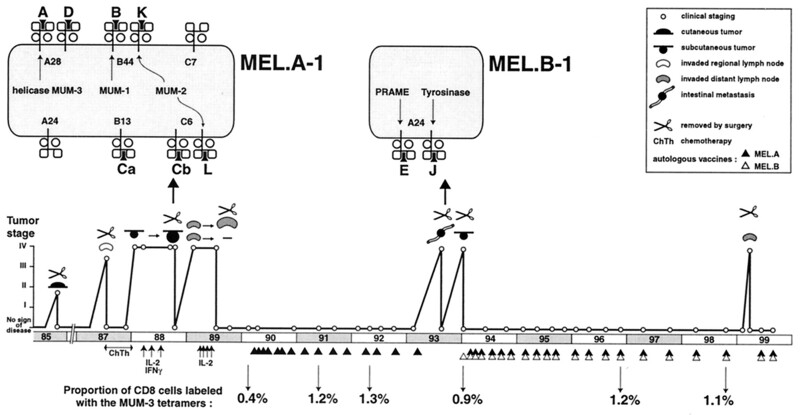 From a metastasis resected in 1988, we derived the clonal cell line MEL.A-1 (11). CTL clones derived from blood lymphocytes collected in 1990 or 1996 were shown to recognize seven Ags on MEL.A-1 cells (12). These Ags, LB33-A, B, Ca, Cb, D, K, and L, were defined with a panel of Ag-loss variants derived from MEL.A-1 by in vitro selection for resistance to lysis by autologous CTL clones. Three of these Ags were identified. Ag B, presented on HLA-B44, is generated by a point mutation in an ubiquitously expressed gene named MUM-1 (melanoma ubiquitously mutated) (13). Ags K and L, presented on HLA-B44 and HLA-C6, respectively, are produced by a single point mutation in another ubiquitously expressed gene, MUM-2 (12). Two overlapping antigenic peptides contain the same mutated residue and bind to either HLA-B44 or C6 molecules. The MUM-1 and MUM-2 mutations were found in cDNA prepared from melanoma metastases resected from patient LB33, indicating that they occurred in vivo. However, they were not found in the 150 tumor samples of various histological origins that were tested, suggesting that they are unique to the LB33 tumor cells. 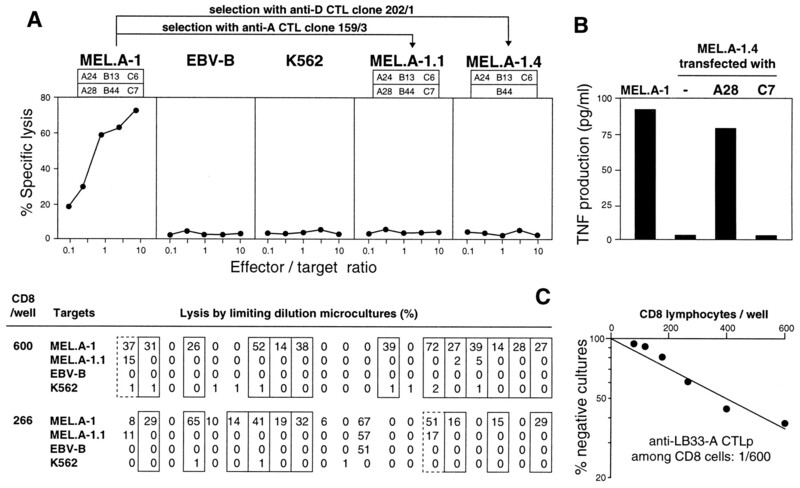 In patient LB33, a role for the anti-MEL.A-1 CTL response in the clinical evolution of the patient is suggested by the observation that the cells of MEL.B, a metastasis that appeared and was resected in 1993, were resistant to all these CTL because of a partial HLA class I loss resulting in loss of expression of Ags A, B, Ca, Cb, D, K, and L (10, 11). Clinical evolution of melanoma patient LB33. The melanoma cell lines derived from metastases are represented with their respective Ags recognized by autologous CTL. More than 50% of the CTL clones that lyse MEL-A.1 and were derived from blood samples collected between 1990 and 1997 recognize Ag A (Ref. 11 and our unpublished observations). Here we show that this Ag is produced by a point mutation in a new RNA helicase gene. The clinical course of melanoma patient LB33 and the characterization of the various LB33-MEL clonal cell lines and Ag-loss variants have been described (10, 11). Melanoma cell line LB33-MEL.A was derived from a s.c. metastasis resected from patient LB33 in 1988, and clonal cell line MEL.A-1 was derived from MEL.A by limiting dilution (11). The tumor cell lines were cultured in Iscove’s medium (Life Technologies, Grand Island, NY) supplemented with 10% FCS (Life Technologies), l-arginine (116 mg/L), l-asparagine (36 mg/L), and l-glutamine (216 mg/L). 293-EBNA-1 cells were cultured in DMEM (Life Technologies) with 10% FCS. TNF-sensitive WEHI-164c13 cells were cultured in RPMI 1640 medium (Life Technologies) with 5% FCS (14). Blood mononuclear cells of patient LB33 were isolated by Lymphoprep (Nycomed, Oslo, Norway) density-gradient centrifugation and cryopreserved in Iscove’s medium supplemented with 10% human serum (HS)3 and 10% DMSO. HS was prepared from pools of plasma from unselected ABO donors. Plasma was supplemented with CaCl2 and bovine thrombin (ICN Pharmaceuticals, Costa Mesa, CA) and allowed to clot for 3 h at 37°C. After centrifugation, serum was decomplemented (30 min at 56°C), filtered through 0.22-μm pore size filters, and UV inactivated (Viralex procedure, PAA Laboratories, Linz, Austria). CTL clone LB33-CTL-159/3 (11) was derived from a pool of 200 CD8 T cells isolated from blood mononuclear cells collected in March 1990, before the patient received autologous vaccines, and stimulated with irradiated cells of a clonal cell line derived from MEL.A-1 in the presence of IL-2 (30 U/ml) and IL-4 (5 U/ml). The microculture was restimulated each week by the addition of irradiated tumor cells and cytokines. After 7 wk, feeder cells (irradiated allogenic EBV-transformed B cells LG2-EBV) were added for the restimulations. Total RNA was extracted from MEL.A-1 cells using the guanidine isothiocyanate procedure (15). Poly(A)+ RNA was enriched with an oligo(dT)-cellulose column (Pharmacia Biotech, Uppsala, Sweden) and converted to cDNA with the Superscript Choice System (Life Technologies, Gaithersburg, MD) using an oligo(dT) primer (5′-ATAAGAATGCGGCCGCTAAACTA(T)18VZ with V = G or A or C; Z = G or A or T or C) containing a NotI site. The cDNA was ligated to HindIII-EcoRI adaptors (Stratagene, Heidelberg, Germany), phosphorylated, digested with NotI, and inserted into the HindIII and NotI sites of expression vector pCEP4 (Invitrogen, San Diego, CA). Escherichia coli DH5α were transformed by electroporation with the recombinant plasmids and selected with ampicillin (50 μg/ml). The library was divided into 528 pools of about 100 cDNA clones. Each pool was amplified for 4 h, and plasmid DNA was extracted using the QIAprep 8 plasmid kit (Qiagen, Hilden, Germany). 293-EBNA-1 cells (4 × 104/microwell) were cotransfected with 1.5 μl of Lipofectamine (Life Technologies), 200 ng of DNA from a pool of the cDNA library, and 50 ng of plasmid pcDNA3 containing an HLA-A*68012 (HLA-A28) cDNA isolated from MEL.A-1 cells. Transfected cells were tested after 24 h for expression of the Ag in a CTL stimulation assay. Briefly, CTL were added, and the TNF content of the supernatant was measured 24 h later by testing its cytotoxic effect on WEHI-164cl3 cells (14) with a 3-[4,5-dimethylthiazol-2-yl]-2,5-diphenyltetrazolium bromide colorimetric assay (16). cDNA clone 4B was sequenced with the dideoxy chain termination method (Thermosequenase cycle sequencing kit, Amersham, Aylesbury, U.K.). The computer search for sequence homology was performed using the program available at http://www.ncbi.nlm.nih.gov/blast/blast.cgi. Sequence alignments were performed with Geneworks software (Intelligenetics, Mountain View, CA). Expression of gene MUM-3 was tested with RT-PCR using primers OPC415 (5′-GAAGGTGATATCTTTGCCATAGTCTC) and OPC414 (5′-GAACACATTGTTTGACCTTCAGTCC) on total RNA extracted from a collection of about 20 normal tissues, including blood, brain, heart, kidney, liver, lung, muscle, and skin. Conditions for PCR amplification were (98°C for 1 min (94°C for 1 min, 65°C for 2 min, 72°C for 3 min) for 30 cycles, then 72°C for 15 min). The screening for MUM-3 mutations in other tumor samples was performed on mRNA extracted from the samples and converted to cDNA with Moloney murine leukemia virus reverse transcriptase using an oligo(dT) primer. This cDNA served as the template for a PCR amplification using primers OPC436 (5′-CTACCACCACACATCCTAACAAGATTA) and OPC455 (5′-CCAAGTGAAATCAGCATAGATGCTG). PCR products were purified using QIAquick PCR purification kit (Qiagen, Valencia, CA) and were sequenced using dideoxy chain method in an ABI-310 automated DNA sequencer (Perkin-Elmer Applied Biosystems, Warrington, U.K.). The GeneBridge 4 radiation Hybrid Panel (Research Genetics, Huntsville, AL) was used to map the MUM-3 gene. Genomic DNA (25 ng) from each of the 93 radiation hybrid clones were PCR amplified with primers OPC436 (5′-CTACCACCACACATCCTAACAAGATTA) and OPC454 (5′-GAGGACAGTCCTTGTGATAGG). PCR amplification was performed for 33 cycles of 1 min at 94°C, for 2 min at 62°C, and for 3 min at 72°C. PCR results were submitted for analysis to the web sites of the Whitehead Institute for Biomedical Research (http://www-genome.wi.mit.edu/cgibin/contig/rhmapper.pl) and of the Genome Database (http://www.gdb.org/gdb). For the microsatellite analysis, genomic DNA was extracted from MEL.A-1 and from autologous blood lymphocytes using the Qiagen genomic DNA purification kit. PCR amplification was performed on 20 ng of DNA using pairs of primers specific for 55 microsatellites selected from the Weber 8 set (Research Genetics). The forward primer was labeled with 32P, and conditions for PCR amplification were (95°C for 4 min (94°C for 40 min, 55°C for 50 min, 72°C for 50 min) for 30 cycles, then 72°C for 10 min). The PCR products were separated on a 6.5% acrylamide-bisacrylamide gel and revealed by autoradiography on a Biomax film (Eastman Kodak, Rochester, NY). Truncated forms of cDNA clone 4B were obtained by digestion with PvuII or HindIII. cDNA 4B served as the template for PCR amplifications of four sequences differing in their 3′ ends and covering the region located between the HindIII and PvuII restriction sites. The forward primer was OPC440 (5′-ACCatgACCTACAGGCTCCTG), which contains a Kozak ATG in-frame with the longest open reading frame of cDNA 4B, and reverse primers were OPC414 (5′-GAACACATTGTTTGACCTTCAGTCC), OPC442 (5′-TAGGATCTTCTACCCAAATCCACC), OPC441 (5′-GCTGTGATTGGTAAAGGCTGAAG), and OPC445 (5′-GTCAGCTTGAGGTTGGAATCTC). PCR conditions were (94°C for 5′, (94°C for 1 min, 65°C for 2 min, 72°C for 3 min) for 30 cycles, then 72°C for 15 min). Amplification products were cloned into pcR3.1 (Invitrogen, San Diego, CA) using the TA cloning procedure, and the constructs were cotransfected into 293-EBNA-1 cells with the HLA-A28 cDNA clone. Peptides were synthesized on solid phase using F-moc for transient NH2-terminal protection as previously described (17) and were characterized using mass spectrometry. All peptides were >80% pure, as indicated by analytical HPLC. Lyophilized peptides were dissolved at 10 mg/ml in DMSO, diluted at 1 mg/ml in PBS, and stored at −20°C. Peptides were incubated for 20 min at room temperature with 51Cr-labeled LB33-EBV-B cells. The CTL clone was added at an E:T cell ratio of 10:1, and chromium release was measured after 4 h.
DNA was extracted, using the QIA Tissue extraction kit (Qiagen), from 6-μm slices of tumor samples fixed in Bouin’s fluid and embedded in paraffin. For the ipsilateral inguinal metastatic lymph node from 1987, one or two sections were used. For the primary melanoma sample from 1985, tumoral tissue from five sections was first microdissected from the normal surrounding tissue with a microdissection laser microscope (P.A.L.M. Mikrolaser Technologie, Wolfratshausen, Germany) (18). Regions of the MUM-1, -2, and -3 genes that encode the antigenic peptides were amplified with PCR using the following forward and reverse primers: MUM-1, OPC194 (5′-AGTTTGCCACTGTTTCTCACTGTC) and OPC195 (5′-CAAACTAGTTGCTTTCTCATGAGGTTA); MUM-2, OPC744 (5′-CTCCCACCACCACTTTCTCCT) and OPC712 (5′-GGCCCCAGGCAGACATGAATT); and MUM-3, OPC743 (5′-CAATGTGTTCATCAGATTCCTTCTG) or OPC436 (5′-CTACCACCACACATCCTAACAAGATTA) and OPC455 (5′-CCAAGTGAAATCAGCATAGATGCTG), or OPC797 (5′-CTCTGAAATCCCATTTACAAGTCAG) and OPC798 (5′-TACCTGATCATTCCAAGTGAAATCAG). PCR products were purified using the QIAquick PCR purification kit and sequenced. Blood CD3+CD8+ lymphocytes, labeled with anti-Leu 4-FITC and anti-Leu 2a-PE (Becton Dickinson, Mountain View, CA), were sorted with a FACS-VANTAGE (Becton Dickinson) flow cytometer and seeded at 600, 400, 266, 177, 118, 79, 52, 36, and 23 cells/well, 96 wells/cell number, in V-bottom microwells (Nunc, Rosklide, Denmark). They were stimulated by addition of 5 × 103 irradiated (10,000 rad) MEL.A-1 cells pretreated with 50 U/ml IFN-γ (Roche, Mannheim, Germany), in a final volume of 100 μl of Iscove’s medium supplemented with 10% HS and 20 U/ml of human rIL-2 (Eurocetus, Amsterdam, The Netherlands; 1 unit/ml is the concentration needed to obtain half-maximal proliferation of mouse CTLL-2 cells), 5 U/ml of IL-4 (1 U/ml of IL-4 gives half-maximal proliferation of human blood T lymphocytes stimulation with PHA; rIL-4 is produced in our laboratory), and 5 ng/ml of rIL-7 (Genzyme, Cambridge, MA). The microcultures were restimulated on day 6 by addition of 100 μl of fresh medium containing rIL-2 (20 U/ml) and 5 × 103 irradiated MEL.A-1 cells. On day 12, 100 μl of medium were discarded, and the cells were transferred into flat-bottom microwells and restimulated by addition of 100 μl of fresh medium with IL-2 and MEL.A-1 cells as on day 6. On day 18, the microcultures were duplicated and restimulated as before. On day 23, the cells were tested for lytic activity. From one set of microcultures, four aliquots of cells were collected and added to 1,000 51Cr-labeled target cells. The other set of microcultures was kept for further restimulation and a second lysis assay to confirm the first results. The numbers of effector cells in the lysis assays ranged from 3,000 to 15,000/test. An HLA-A*68012 cDNA clone from MEL.A-1 cells was used as a template to amplify the sequence coding for the extracellular domains (aa 1–276 of the mature protein) of the HLA-A28 heavy chain with primers OPC782 (5′-AGAAGGAGATATACCATGGGtTCaCACagtATGcgcTATTTtTACACtTCCGTGTCCCGG) and OPC761 (5′-GGGCTGGGAAGATTCGAAGATGTCGTTCAGACCACCACCCGGCTCCCATCTCAGGGTGAGG). OPC782 contains several base changes (small letters) designed to optimize protein expression in E. coli BL21(DE3)pLysS. The PCR product was digested with NcoI and SfuI, and cloned into a vector derived from pET3D (Stratagene) and containing a BirA biotinylation site in-frame with the 3′ end of the HLA sequence. Recombinant HLA-A*68012 molecules were folded in vitro with β2m (pHN1-β2m, provided by P. Moss, Oxford University, Oxford, U.K.) and MUM-3 peptide as previously described (19). Soluble complexes were purified by gel filtration and biotinylated using the BirA enzyme (Avidity LCC, Denver, CO). PE-labeled tetramers were produced by mixing the biotinylated complexes with Extravidin-PE (Sigma, St. Louis, MO). Blood mononuclear cells collected from patient LB33 in 1996 were labeled with an anti-CD8 Ab coupled to allophycocyanin (1/20; Becton Dickinson) and with the PE-labeled MUM-3 tetramers (0.2 μM final). CD8+ MUM-3 TCR+ cells were seeded at one cell per well in flat-bottom nanowells, using the FACS-VANTAGE. They were stimulated with 2 × 103 irradiated (10,000 rad) MEL.A-1 cells, pretreated with 50 U/ml of IFN-γ for 48 h, 2 × 104 irradiated (10,0000 rad) blood mononuclear cells from three donors, and 2 × 104 (10,0000 rad) irradiated LG2-EBV-B cells (A24-A32-B35-B44-C4) in a final volume of 80 μl of Iscove’s medium supplemented with 10% HS, 100 U/ml of rIL-2, 5 U/ml of rIL-4, and 100 U/ml of rIL-6 (1 U/ml of IL-6 is the concentration needed to obtain half-maximal proliferation of mouse 7TD1 cells) (20). Recombinant IL-6 was used in this experiment, but similar results were obtained with rIL-7 (5 ng/ml). On day 12, 40 μl of medium was discarded, and the lymphocytes were restimulated by addition of 40 μl of the same mixture of stimulator, feeder cells, and growth factors as on day 0. TCR Vβ usage was assessed by RT-PCR and sequencing. cDNA served as a template for a PCR amplification using a panel of Vβ-specific forward primers and one reverse Cβ primer (21, 22). The PCR products were purified and sequenced. Clonal melanoma cell line MEL.A-1 was derived from a metastasis resected from patient LB33 in 1988. Autologous CTL clone 159/3, directed against Ag LB33-A, specifically lysed MEL.A-1, but not the Ag-loss variant MEL.A-1.1, which is still recognized by the other CTL clones (11). Another Ag-loss variant, MEL.A-1.4, which had been selected from MEL.A-1 for resistance to lysis by an anti-D CTL (11), also proved to resist lysis by CTL 159/3 (Fig. 2⇓A). It had lost expression of HLA-A28 and C7 molecules. When these cells were transfected with an HLA-A28 construct, they were recognized by CTL 159/3 (Fig. 2⇓B), indicating that Ag LB33-A was presented by HLA-A28 molecules. Characterization of the anti-LB33-A CTL. A, Lytic activity of CTL clone 159/3. Target cells included MEL.A-1, a clonal cell line derived from a melanoma metastasis of patient LB33; autologous EBV-transformed B cells; NK target cells K562; MEL.A-1.1, an Ag-loss variant derived from MEL.A-1 by selection for resistance to lysis by CTL 159/3; and MEL.A-1.4, a variant of MEL.A-1 selected for resistance to lysis by CTL clone 202/1, which recognized Ag LB33-D on HLA-A28 molecules. The HLA alleles expressed by the LB33-MEL clonal cell lines are indicated. B, HLA restriction of CTL 159/3. MEL.A-1.4 cells were transfected with cDNA encoding the autologous HLA-A*68012 (A28) or HLA-Cw*0704 (C7) molecule, cloned into expression vector pcDNA3. After 24 h, CTL 159/3 was added to the transfected cells, and production of TNF was measured 24 h later. C, Limiting dilution analysis of anti-MEL.A-1 CTLp. Examples of lytic patterns obtained in limiting dilution microcultures and frequency of CTLp lysing MEL.A-1, but not MEL.A-1.1, cells. Microcultures were set up with various numbers of CD8 blood lymphocytes collected from patient LB33 in 1990 and stimulated with irradiated MEL.A-1 cells, IL-2, IL-4, and IL-7. Approximately 500 microcultures were set up in each experiment. On day 23, the lytic activity of aliquots of the microcultures was measured against the indicated target cells in the presence of a 50-fold excess of unlabeled K562 to inhibit the lytic activity of NK-like effectors. All the microcultures were tested, and the results are shown for 20 contiguous microcultures of plates set up with 600 or 266 cells/well. Among the microcultures that did not lyse (<5%) EBV-B or K562 cells, those that satisfied the criteria (lysis of MEL.A-1 >10% and lysis of MEL.A-1.1 one-third the lysis of MEL.A-1), were considered to contain anti-LB33-A CTL. They are boxed. Microcultures with (lysis of MEL.A-1 >10% and lysis of MEL.A-1.1 >10%) were considered to contain CTL recognizing an Ag different from LB33-A. They are boxed with a dashed line. To estimate the frequency of precursors of anti-A CTL (CTLp) in the blood of patient LB33, a LDA was set up with CD8 lymphocytes stimulated every 6 days with irradiated MEL.A-1 cells in the presence of IL-2, IL-4, and IL-7. On day 23, the lytic activity of the microcultures was tested. About 90% of the microcultures that lysed MEL.A-1 did not lyse MEL.A-1.1, indicating that they contained an anti-A CTL. The frequency of anti-A CTLp was 1/600 among blood CD8 lymphocytes collected in 1990 (Fig. 2⇑C). We concluded that a high frequency of tumor-specific CTLp was present in the blood of patient LB33, and that most of them recognized the same Ag. A cDNA library prepared with mRNA extracted from MEL.A-1 cells was cloned into expression vector pCEP4, which contains the EBV origin of replication. About 500 pools of 100 cDNA clones of the library were cotransfected with the HLA-A28 construct into 293-EBNA1 cells. After 24 h, the transfectants that expressed Ag LB33-A were detected by their capacity to stimulate the production of TNF by CTL 159/3. One pool of cDNA proved positive. It was subcloned and a cDNA clone of 4.5 kb, named 4B, was isolated (Fig. 3⇓A). A stable transfectant derived from the Ag-loss variant MEL.A-1.1 was also recognized by CTL 159/3 (Fig. 3⇓B). Identification of a cDNA clone encoding Ag LB33-A. A, Stimulation of CTL 159/3 by 293-EBNA1 cells (40,000 cells/well) cotransfected with cDNA 4B cloned into expression vector pCEP4 and with an HLA-A28 cDNA cloned into vector pcDNA3. CTL (2,000 cells/well) were added after 24 h, and the concentration of TNF released in the medium was measured 24 h later using the TNF-sensitive WEHI-164c13 cells. B, Lysis by CTL 159/3 of MEL.A-1.1 cells transfected with a fragment (nt 502-2024) of cDNA 4B cloned into vector pCR3.1, whose copy number is not amplified after transfection in these cells. Stable transfectants were selected for resistance to G418. The sequence of cDNA 4B corresponded to a new gene, provisionally named MUM-3. When a Northern blot of RNA from LB33 melanoma cells was hybridized with a fragment of cDNA 4B, a band of 10 kb was observed, indicating that the cDNA was incomplete. An open reading frame of 3.8 kb, probably incomplete at its 5′ end, codes for a putative protein of 1330 aa. This protein shares 50–65% of homology with members of the RNA helicase family, namely the yeast protein YG50 (GenBank accession no. Z73056), the human U5 200-kDa protein (GenBank accession no. CAA94089), and BBR2 (GenBank accession no. U18992), the yeast homologue of U5 200-kDa (23). These proteins contain about 2000 aa, are translated from mRNA of ±10 kb, and contain two homologous sets of seven motifs of ±10 aa that are conserved in helicases. In these RNA helicases, the second of these motifs contains the DExH amino acid sequence. The MUM-3 protein encoded by cDNA 4B contains only one of the two sets of conserved amino acids, including the DExH sequence. These results suggest that MUM-3 is a new member of the DExH RNA helicase gene family. Using DNA from a panel of human-hamster radiation hybrids, gene MUM-3 was located on chromosome 6q16–21. As expected, gene MUM-3 was found to be expressed ubiquitously. Transfections of truncated forms of cDNA 4B indicated that the sequence coding for the antigenic peptide was located between nt 626 (HindIII) and 1267 (PvuII) of the cDNA (Fig. 4⇓A). With a set of minigenes covering this region, the portion of cDNA encoding the Ag was narrowed down to a 153-bp sequence. This region contains four peptides of nine residues with a basic amino acid in position 9, as usually found in peptides that bind to HLA-A*68012 molecules, the HLA-A28 subtype of patient LB33 (24, 25). One peptide, EAFIQPITR, sensitized autologous EBV-transformed B cells to lysis by CTL 159/3, with a half-maximal effect at 1 nM (Fig. 4⇓B). Identification of the LB33-A antigenic peptide. A, cDNA clone 4B is represented as a box with a large open reading frame and a 3′ untranslated region. The latter contains a polyadenylation signal and a poly(A) tail. The seven stretches of 10 aa corresponding to conserved helicase motifs are indicated as black boxes. PvuII (P) and HindIII (H) restriction sites were used to produce truncated cDNAs, as detailed in Materials and Methods. Minigenes, represented with arrows, were amplified by PCR with a common sense primer containing an initiation codon and different antisense primers. The products were cloned into vector pCR3, and the constructs were cotransfected with an HLA-A28 cDNA into 293-EBNA1 cells. Recognition of the transfectants by CTL 159/3 was tested with a TNF production assay. The GenBank accession number of cDNA clone 4B is AJ223948. The corresponding gene has been named DDX22 by the Human Gene Nomenclature Committee. B, Titration of the antigenic peptide was performed with 51Cr-labeled LB33-EBV-B cells incubated over 15 min at room temperature with the indicated concentrations of peptides. CTL clone 159/3 was added at an E:T cell ratio of 10, and chromium release was measured after 4 h.
The ubiquitous expression of gene MUM-3 suggested that the antigenicity of the tumor could result from a mutation in the region coding for the peptide. A 450-bp cDNA fragment surrounding the peptide-coding region was amplified by PCR from RNA extracted from blood lymphocytes of patient LB33. The sequence differed from that of cDNA 4B by one nucleotide: C instead of T at position 752. The C→T mutation was also found in a tumor sample from patient LB33, indicating that it did not occur in vitro. C to T transition at a dipyrimidine site, as is the case here, is a classical mutation induced by UV irradiation (26). Both the normal and the mutated sequences were found in DNA of MEL.A-1 cells, indicating that the tumor is heterozygous. MUM-3 fragments corresponding to nt 600–900 of cDNA 4B were amplified by PCR from reverse transcribed mRNA of 150 tumor samples of various histological origins and sequenced. No mutation was found in this region of gene MUM-3. The mutation changes a serine (TCC) into phenylalanine (TTC) at position 3 of the antigenic peptide recognized by CTL 159/3. The normal peptide, EASIQPITR, does not sensitize autologous EBV-B cells to lysis by CTL 159/3, even at 100 nM (Fig. 4⇑B). A competition assay indicated that the normal peptide binds very poorly to HLA-A28 molecules, suggesting that the phenylalanine residue is part of the aggretope of the peptide. Gene MUM-3 contains the third antigenic mutation that is found in the melanoma cells of patient LB33; we previously described two other genes, MUM-1 and MUM-2, that also contain a point mutation leading to the expression of a tumor Ag recognized by autologous CTL (12, 13). We therefore considered that the antigenicity of these tumor cells, which may have determined the very favorable clinical evolution of the patient, resulted from the presence of an unusually high number of mutations. The first explanation for the accumulation of mutations could be a defect in the DNA repair mechanisms. One of them, the mismatch DNA repair system, corrects errors made by DNA polymerase during replication. A defect in this DNA repair system results in microsatellite instability, namely variations in the lengths of small repetitive regions (microsatellites) in the genome. The lengths of 55 microsatellites were compared in DNA extracted either from MEL.A-1 cells or from autologous blood lymphocytes (Table I⇓). No difference was found, suggesting that this DNA repair system functions normally in LB33 melanoma cells. Interestingly, the tumor cells showed loss of heterozygosity for four markers, two of which are located on chromosome 9 around the p16 locus, which is frequently altered in melanomas (27, 28, 29). Another possible reason for the presence of many mutations in the tumor cells is chemotherapy, which patient LB33 had received before the resection of the metastasis from which cell line MEL.A-1 was derived in 1988. According to this hypothesis, the antigenic mutations would be absent in the primary tumor and in the lymph node metastasis resected in July 1987 before chemotherapy. Genomic DNA was extracted from sections of paraffin-embedded fragments of these two tumors, and the Ag-coding region of genes MUM-1, MUM-2, and MUM-3 was amplified by PCR and sequenced. The three antigenic mutations were present in these products, demonstrating that they do not result from the chemotherapy. To obtain more information on the frequency of the anti-MUM-3 T lymphocytes in patient LB33, we made use of multimeric soluble MHC-peptide complexes to specifically label these T cells. This type of reagent has proven to be a specific and sensitive tool to enumerate Ag-specific T lymphocytes (19, 30). Soluble recombinant HLA-A28 molecules were folded with the mutated MUM-3 peptide, biotinylated, and multimerized with avidin conjugated to PE. Even though their m.w., estimated by gel filtration, showed that these complexes contained more than four HLA molecules, we will refer to them as tetramers. The MUM-3 tetramers labeled CTL 159/3, but not CTL 202/1, which is also restricted by HLA-A28 molecules but recognizes the LB33-D Ag (Fig. 5⇓A). Labeling anti-MUM-3 T lymphocytes with tetramers. A, CTL clones 159/3 (anti-MUM-3.A28) and 202/1 (anti-LB33-D, HLA-A28-restricted) were incubated for 15 min at 37°C with MUM-3 tetramers coupled to PE and for 15 min at 4°C with an anti-CD8 Ab coupled to peridinin chlorophyll protein (PerCP). The cells were washed, fixed with paraformaldehyde, and analyzed by flow cytometry. Thin lines represent cells incubated without tetramers. We verified with an anti-TCRαβ Ab that similar amounts of TCR were present at the cell surface of the two CTL populations. B, Blood mononuclear cells collected from patient LB33 in 1996 were incubated with the MUM-3 tetramers and with an anti-CD8 Ab coupled to allophycocyanin, washed, and sorted by flow cytometry. The labeling by anti-CD8 Abs and tetramers (right panel) was analyzed on lymphocytes, selected on the basis of their light scattering properties (left panel). Blood mononuclear cells collected from patient LB33 in 1996 were labeled with the MUM-3 tetramers and an anti-CD8 Ab. Approximately 1.2% of the CD8 cells were tetramer positive (Fig. 5⇑B). To assess the specificity of the tetramer staining, blood lymphocytes from four HLA-A28 donors were labeled with MUM-3 tetramers. No staining was observed. The tetramer-positive cells of patient LB33 were also seeded at one cell per well, and the presence of a cell was confirmed visually in 80% of the wells. The lymphocytes were stimulated with irradiated MEL.A-1, feeder cells, IL-2, IL-4, and IL-6. After 3 wk, clonal populations of more than a million cells, corresponding to at least 20 divisions, were present in 87% of the wells that initially contained one cell. Most (58 of 60) of these clones were labeled with the MUM-3 tetramer. Their lytic activity was tested against MEL.A-1 and against autologous EBV-B cells incubated with the mutated or the normal MUM-3 peptide. All clones were lytic and displayed the same specificity as CTL 159/3. We conclude that the majority of the tetramer-positive blood CD8 cells were indeed anti-MUM-3 CTL or CTLp, and that these cells appeared functional, in so far as they could be restimulated in vitro with Ag and growth factors. The diversity of the anti-MUM-3 CTL response was analyzed. Most clones (53 of 57) expressed the same TCR Vβ-chain, with a (Vβ6.5-Jβ2.5) rearrangement. The four other anti-MUM-3 clones expressed totally different TCR β-chains, using Vβ7.3, Vβ9.1, Vβ9.3, or Vβ13.1 gene segments. We followed the frequency of MUM-3-specific CD8 cells in blood samples collected from patient LB33 between 1990 and 1998. The frequency was ∼0.4% in 1990 and remained stable at around 1% from 1991 to 1998 (Fig. 1⇑). In LDAs when the lymphocytes were stimulated for 3 wk with MEL.A-1 cells and growth factors, ∼0.15% of the blood CD8 T cells collected from patient LB33 in 1990 were enumerated as anti-MUM-3 (Fig. 2⇑C). Similar frequencies were obtained in limiting dilution experiments with lymphocytes collected in 1996. Using the tetramers, the frequency of anti-MUM-3 T cells increased by a factor of 8, reaching 1.2% of CD8 cells in 1996 (Fig. 5⇑B). That LDA estimates are lower than enumeration with tetramers was reported in previous studies on murine and human CTL responses (31, 32). This difference could result from the fact that a fraction of the anti-MUM-3 T lymphocytes either were terminally differentiated and unable to proliferate, or could not differentiate into CTL detected at the end of the LDA. Considering that most of the tetramer-positive cells, when restimulated in vitro, proliferated and differentiated into CTL, we ruled out these hypotheses. Another possibility was that some of the anti-MUM-3 CTL did not proliferate in the LDA, either because they were not properly restimulated or because they underwent apoptosis upon restimulation, a phenomenon known as activation-induced cell death (33). Finally, some of the anti-MUM-3 CTL could have escaped detection in the LDA lysis assay because they constituted too small a proportion of the lymphocytes in microcultures that also contained several other proliferating clones. When comparing the protocols of in vitro restimulation that we used in the LDA and tetramer cloning assays, we observed that the major difference was the presence, in the latter assay, of feeder cells consisting of a mixture of irradiated allogeneic EBV-B cells and irradiated allogeneic blood mononuclear cells. In preliminary experiments we had observed that when tetramer-positive cells were sorted and stimulated with MEL.A-1 without feeder cells, they proliferated for a few days and then stopped dividing. To test whether the addition of feeder cells could improve the LDA assay, microcultures were set up with various numbers of CD8 blood lymphocytes, from 1996, stimulated every 6 days with MEL.A-1 cells and growth factors (IL-2, IL-4, and IL-7) in the presence or absence of irradiated autologous blood mononuclear cells. We could not use allogeneic feeder cells as in the tetramer cloning assay, because these cells would stimulate alloreactive T cells. On day 27, we counted the wells containing living cells and calculated the frequencies of precursors of proliferating CD8 T cells in the assay (1/60 and 1/34 in the absence or the presence of feeder cells, respectively; Fig. 6⇓). In addition, we observed that on the average, more cells (3- to 5-fold) were present in microcultures containing feeder cells. Addition of feeder cells in the LDA analysis of anti-MUM-3 CTLp. 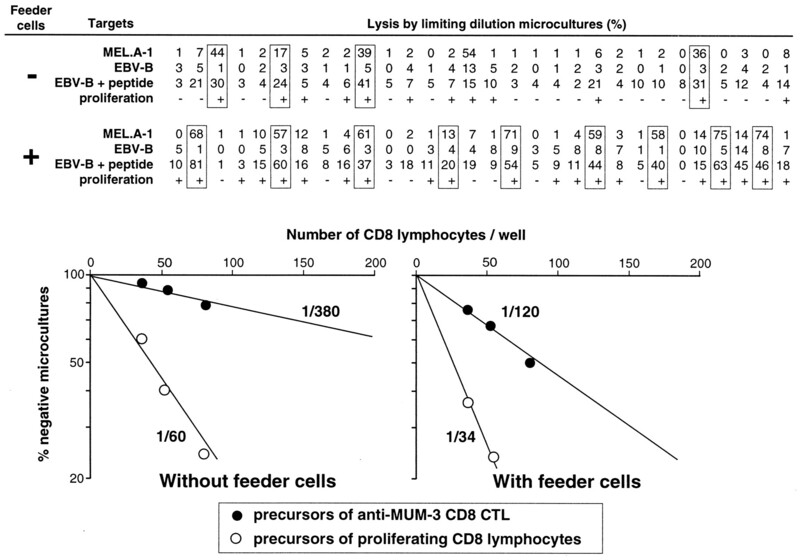 Examples of lytic patterns and proliferation obtained in limiting dilution microcultures, and frequencies of CTLp lysing MEL.A-1 and EBV-B plus peptide, but not EBV-B cells alone. Microcultures were set up with various numbers (266, 177, 118, 79, 52, and 36 cells/well, 96 wells/condition) of LB33 CD8 blood lymphocytes, collected in 1996, stimulated with irradiated MEL.A-1 cells (104 cells/well), IL-2, IL-4, and IL-7 and with or without irradiated autologous blood mononuclear cells (105 cells/well). On day 27, the lytic activity of aliquots of the microcultures was measured. Microcultures that satisfied the criteria (lysis of MEL.A-1 >10% and lysis of EBV-B less than one-third the lysis of MEL.A-1, and lysis of EBV-B plus peptide >10% and >3 times the lysis of EBV-B) were considered to contain an anti-MUM-3 CTL and are boxed. The results shown in the table were obtained with microcultures seeded at 177 cells/well. The lytic activity of the microcultures was then tested against MEL.A-1 and against EBV-B cells incubated with or without the MUM-3 peptide (Fig. 6⇑). 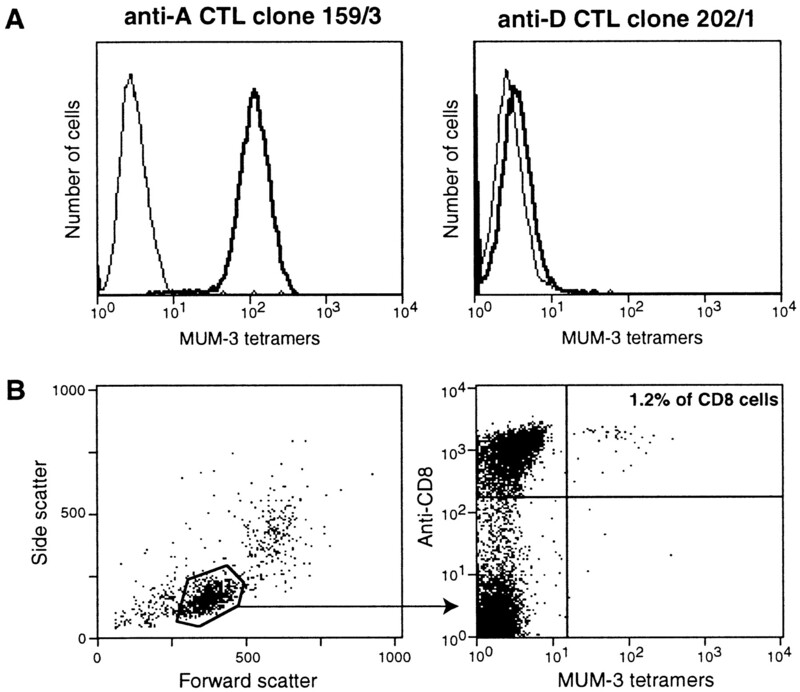 The anti-MUM-3 CTLp frequencies were 1/380 among CD8 cells without feeder cells and 1/120 in the presence of feeder cells, a frequency now comparable to that (1.2% of CD8 cells) observed by labeling blood cells from 1996 with the tetramers (Fig. 5⇑B). Helicases use the energy of nucleoside triphosphate hydrolysis to unwind the strands of DNA, RNA, or RNA-DNA duplexes. They are involved in DNA replication, recombination, and transcription and in RNA splicing and translation. Their sequence is characterized by seven conserved motifs of about 10 residues. Motifs I and II, the latter containing a DEAD or DExH box, are involved in ATP or GTP hydrolysis (34, 35, 36). More than 40 human sequences containing these motifs have been reported, but helicase activity has been documented for only about 10 of them. Among the 20 reported mutated Ags that are recognized by tumor-specific CTL, it is remarkable that MUM-3 is not the first helicase; a mutated murine helicase, named p68, was found to encode an Ag recognized by CTL on a UV-induced sarcoma (37). p68 contains a DEAD motif and is probably also an RNA helicase. In addition, a search for genes that are specifically expressed in tumors recently lead to the identification of a new gene, which was named HAGE, that codes for a putative helicase containing a DEAD motif (V. Martelange et al., manuscript in preparation). It is possible that the MUM-3 and p68 mutations contribute to tumor development, given that mutations in human helicase genes are found in cancer-prone syndromes such as xeroderma pigmentosum (38, 39), Bloom’s syndrome (40), Werner’s disease (which is characterized by premature aging) (41, 42), X-linked mental retardation associated with α-thalassemia (43), and Cockayne’s syndrome (38, 44). All the helicases implicated in these diseases are involved in DNA repair mechanisms. The frequency of anti-MUM-3 T cells in the blood of patient LB33 is remarkably high, whether it is measured with tetramers or with an optimized protocol of in vitro restimulation with autologous tumor cells in limiting dilution conditions. Considering that the blood contains only 2% of all the lymphocytes present in one individual (45), that 1 ml of blood contains 106 mononuclear cells, and that in patient LB33 20% of these cells are CD8, the total number of anti-MUM-3 CTL in patient LB33 is 6 × 108. Similar or even higher (up to 10% of CD8 cells) frequencies were reported for T cells recognizing EBV, HIV, or HTLV-1 epitopes, suggesting that such frequencies are not exceptional (32, 46, 47). Less information is available concerning the frequencies of blood CD8 T cells that recognize tumor cells. One melanoma patient was reported with a high frequency (2%) of CD8 blood cells labeled with a tetramer containing a tyrosinase peptide (48), but these cells appeared anergic, in so far as they failed to lyse the appropriate target cells in vitro and did not produce cytokines. Frequencies of anti-Melan-A/MART-1 lymphocytes ranging between 0.01 and 0.7% of blood CD8 T cells were found in melanoma patients and, surprisingly, also in healthy donors (48, 49, 50, 51). When these cells were sorted and restimulated in vitro, proliferation was observed, and the responding cells displayed a Melan-A-specific lytic activity. This indicates that at least some of the circulating CD8 cells labeled with Melan-A tetramers are not anergic. All these results concern T cells that recognize antigenic peptides that are not tumor specific but are encoded by genes expressed in melanocytes and melanomas. It may not be a coincidence that such anti-melanocyte T cells are found in healthy individuals and that some of them appear to be nonfunctional in vivo. The anti-MUM-3 T cells of patient LB33 participate in the first strong CTL response documented that is directed against a strictly tumor-specific Ag. The population of circulating anti-MUM-3 CTL is large and stable over time. A high frequency of anti-MUM-3 T cells was already present in 1990, before the patient received the first injections of irradiated autologous tumor cells. It is possible that the high doses of IL-2 that the patient received in 1988 and 1989 participated in the expansion of the anti-MUM-3 response, but this hypothesis cannot be evaluated because of the absence of lymphocytes collected before 1990. The frequency of anti-MUM-3 CTL appeared to remain stable between 1991 and 1998, suggesting that the CTL were regularly restimulated in vivo, either by a clinically undetectable number of tumor cells, by the irradiated MEL.A-1 cells that were regularly injected as an autologous vaccine, or by a cross-reactive Ag. A databank search found peptide EATIQEITR, which shares seven of nine residues with the mutated MUM-3 peptide, in the sequence of the acyl-coenzyme A synthetase of Mycobacterium tuberculosis, against which patient LB33 was immunized, but this peptide was not recognized by the anti-MUM-3 CTL clones. The vast majority (93%) of the anti-MUM-3 CTL express the same Vβ6.5 TCR, and this dominance of one clone was maintained between 1990 and 1998. The most likely explanation, which we proposed for the CTL response against Ags of the murine mastocytoma cells P815 (52), is that the dominance was installed when the first anti-MUM-3 CTLp, which happened to express a Vβ6.5 TCR, was stimulated and started to proliferate well before other anti-MUM-3 CTLp. The dominance was then maintained at each immunization with the autologous tumor cells because the increased frequency of the Vβ6.5 CTL decreases the probability that other anti-MUM-3 CTLp could be restimulated before the clearance of the Ag. The MEL.B cells, derived from a metastasis removed from the patient in 1993, lost the expression of several HLA class I genes, rendering them resistant to all the anti-MEL.A-1 CTL (11). It is tempting to believe that the strong anti-MEL.A-1 CTL response selected the Ag-loss variant MEL.B cells in vivo. However, the anti-MUM-3 CTL do not appear to have shaped the pattern of Ag expression on two other metastases that patient LB33 developed in 1994 and 1999 (Fig. 1⇑), because we observed that cell lines derived from these tumors were sensitive to lysis by anti-MUM-3 CTL. We will try to understand how these metastases escaped rejection by anti-MUM-3 CTL. The strong CTL response of patient LB33 against a mutated tumor Ag is not unique; we recently found that a lung carcinoma patient with a survival exceeding 10 years had 0.5% of his blood CD8 cells labeled with an HLA-A2 tetramer containing a mutated peptide identified in the autologous tumor (V. Karanikas et al., manuscript in preparation). Together, these results indicate that a strong CTL response, measurable in the blood, against a strictly tumor-specific Ag is present in some patients. This contrasts with what has been observed to date in clinical trials with tumor-specific shared Ags encoded by MAGE-A genes. In a recently completed trial, 25 tumor-bearing HLA-A1 melanoma patients received injections of a MAGE-A3 peptide presented by HLA-A1 (53). Tumor regressions were observed in seven patients, and three of these regressions were complete, but no increase in anti-MAGE CTL could be detected in the blood of these patients, including those whose tumor regressed. It is possible that this absence of detectable CTL response results from a modality of immunization that is not very efficient. Our results indicate that it is justified and feasible to evaluate other modalities of immunization against tumor-specific Ags by measuring blood T cell responses with tetramers. However, it remains to be determined whether a strong tumor-specific T cell response is required for tumor rejection. It is possible that tumor rejection responses are mediated by small numbers of tumor-specific T cells of a type, to be defined, that renders them extremely efficient. This may explain why it has been impossible to date to establish a correlation between tumor and T cell responses in patients vaccinated with tumor-specific or melanocyte differentiation Ags (53, 54, 55). It is worth noting that in these patients the monitored immune responses were those directed against Ags present in the vaccine, leaving open the possibility that strong responses against other Ags developed as a bystander effect of the vaccination. Answering this question will require concomitant analyses of T cell responses in the blood and in regressing tumors of patients responding to vaccination. We thank H. Maes for his contribution to the microsatellite analysis; Thérèse Aerts, Catherine Müller, and Christine Mondovits for excellent technical assistance; Drs. Van den Eynde and van der Bruggen for critically reading the manuscript; and Suzanne Depelchin and Simon Mapp for editorial assistance. Dr. Grangeponte (Service d’Anatomie Pathologique, Centre Hospitalier Régional Universitaire Trousseau, Tours, France) kindly provided tumor tissues from patient LB33. ↵1 This work was supported by grants from the Fonds J. Maisin (Belgium), the Fédération Belge contre le Cancer (Belgium), the FB-Assurances and VIVA (Belgium), and the Belgian Program on Interuniversity Poles of Attraction initiated by the Belgian state, Prime Minister’s Office, Office for Science, Technology, and Culture. J.-F.B. is a Research Assistant with the Fonds National de la Recherche Scientifique (Belgium). ↵3 Abbreviations used in this paper: HS, human serum; LDA, limiting dilution analysis. Davis, L. G., M. D. Dibner, J. F. Battey. 1986. Guanidine isothiocyanate preparation of total RNA. L. G. Davis, et al ed. Basic Methods in Molecular Biology 130 Elsevier, New York.